We’ve had several days lately that have felt like spring —sun, blue sky, milder temperatures—but the garden is still producing winter vegetables and the first new greens and asparagus are a ways off. What to do to make winter vegetables match this early taste of spring? The answer was right in front of me with a basket of Brussels sprouts and leeks, both in shades of green and soft creamy yellow and looking more like spring than winter. A friend has just given me some Meyer lemons from a backyard tree in Berkeley, CA, a treat we look forward to when Mary comes back from visiting her mom there. Meyer lemon vinaigrette on lightly roasted Brussels sprouts sounded perfect. I pulled the outer leaves from the sprouts, quartered them because they were quite large, tossed them in a little olive oil, spread them out on a sheet pan and put them in a 400-degree oven. They were crisp/soft in five or six minutes. While they were roasting, I removed the zest from a lemon, squeezed out the juice and added it to the zest, added about a tablespoon of diced shallot, a dash of salt and some grinds of pepper and whisked in enough olive oil to make a thick dressing. While the sprouts were still warm, I poured the dressing over them. They were delicious warm and I knew they would be just as good at room temperature. And the leeks? Since the oven was already hot, roasting the leeks made sense too. I cut them in half, arranged them on a sheet pan, oiled them lightly and roasted them at about 375 until they were soft, about half an hour. Even the darker green upper shafts softened and released delicious leek flavor. 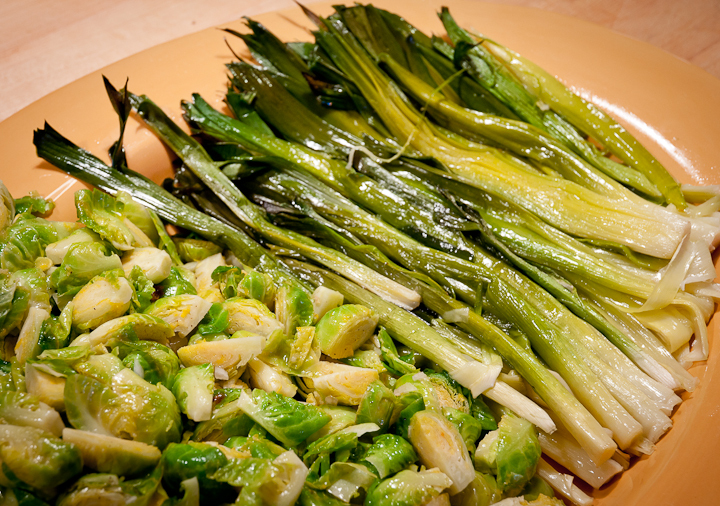 Their mild onion sweetness was a perfect pairing for the lemony, earthy Brussels sprouts. Together, they looked and tasted like spring. What a gift from these hardy, long-season winter vegetables. 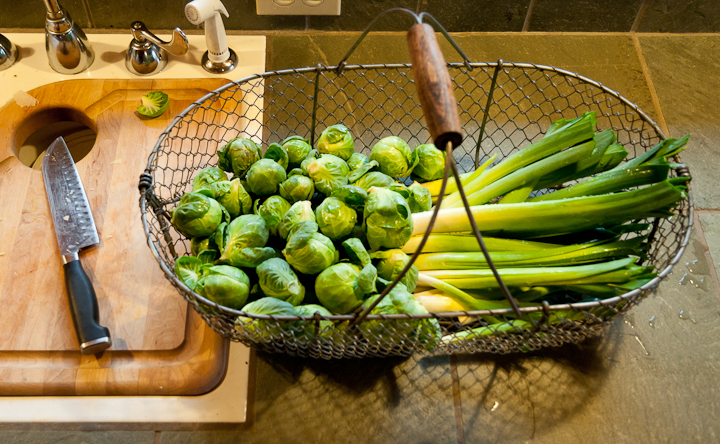 Leeks and Brussels sprouts begin their long growing season just as spring is ending in late May and early June. As I wrote in an earlier post, I start leeks in late May and they are ready to harvest in October: https://lopezislandkitchengardens.wordpress.com/2011/08/05/growing-leeks/. I start Brussels sprouts around the first week of June, planting the seed indoors in pots, hardening them off about a month later and setting them out in the garden two feet apart in two rows thirty inches apart. I cover them with Reemay for several weeks to prevent maggot flies from laying eggs at the base of the plants. I also mulch them heavily once the plants are established and water them regularly. They grow steadily until fall when I begin harvesting them after the first frost. They survive winter temperatures in the high teens, but when it’s that cold I often cover them with a tarp, probably more for my sense of security than the plant’s needs. Varieties that have grown well in my garden are Vancouver, Diablo, Gustus and, a new addition for this year that I’ll repeat, Nautic, pictured in the photo below. 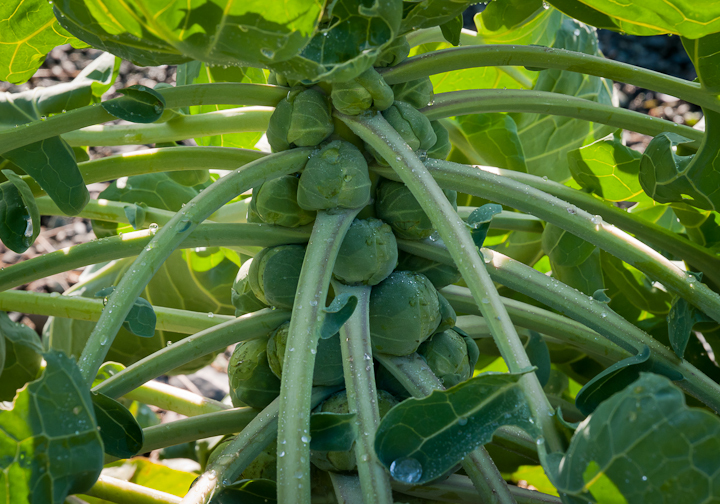 Aphids can attack Brussels sprouts plants, working their way into the sprouts, but they haven’t been a problem in my garden, perhaps because I plant Brussels sprouts relatively late, following a suggestion I read in a West Coast Seed catalog years ago. One additional step I’ve tried this year is “topping” them, cutting out the growing tip of the plant at the end of the summer. Many seed catalogs suggest doing this in order to direct all the plant energy to filling out the sprouts already formed along the stock but I had never gotten around to it. This year, I topped some and left others for comparison. The topped plants definitely formed bigger sprouts all the way up the stalk to the truncated top. Those plants that weren’t topped have continued to produce tasty, slightly flattened sprouts up to the growing tip as in the photo above. This coming year, I’ll probably top most but not all of the plants. It’s still several months before I’ll be planting the next year’s crops of leeks and Brussels sprouts. In the meantime, I’ll enjoy these winter vegetables disguised as spring vegetables or back in their winter roles if winter returns. 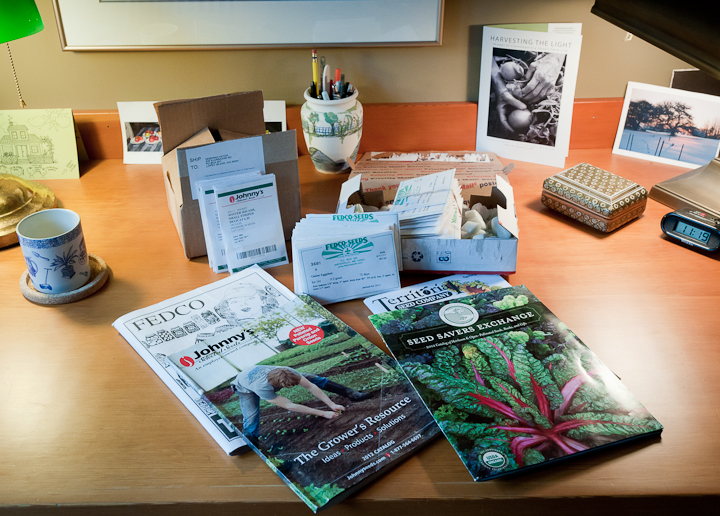 Seed catalogs are one place to find new seed varieties and to reorder favorites, but another great source for seeds is seed exchanges, organized events where people bring seeds to share and exchange with others. A big plus of seed exchanges is that the seeds are open-pollinated and heirloom seeds, often saved by local gardeners happy to share seeds of varieties that grow well in their gardens and to give tips on how you too can save seeds. Last Saturday my friend Carol and I went to the 3rd Annual Heritage Seed Exchange on Orcas Island. As the poster says, and as Ginger Moore, one of the volunteer organizers told me, everyone was welcome, with or without seeds to share or experience saving seeds. I was bringing some bean seeds I’d saved and Carol had some unusual herbs and tubers she had potted up. We had high hopes for what we might find in exchange. On the boat over, we met up with Jeanie and Nancy, two other Lopez seed lovers who shared our anticipation. In the West Sound Community Hall, long tables were covered with seed packets organized by the degree of experience needed to save each seed variety. Each table also had a sign-in sheet so that people who brought seeds to share could leave the names of the seeds they brought and their name, phone or email so that people who took the seeds could reach them if they needed more information. In her introductory remarks, Heritage Seed Exchange organizer and Orcas seed saver Ronda Jones emphasized the importance of saving seeds as a way to maintain local stocks of seeds and to counter the consolidation of seed companies and their frightening pattern of dropping old varieties and promoting genetically modified seeds. She reminded us to plan to save seeds of those we take and plant and bring some to the exchange next year. Going first to the bean table, Carol and I were delighted to find locally grown seeds of Bonds Orcas white runner bean, a bean we suspect is related to one of my favorite beans, a white runner my late neighbor Frances Kring gave me years ago, telling me that all old-timers grew it. We also found seeds of a Sicilian Fava bean that Ronda Jones grew from seeds given to her by a friend in Italy. These are a purple fava and Ronda told me I’d like them even better than the green Broad Windsor. I can’t wait to try them. At another table, I found parsnip seeds, described as a fifth generation Orcas seed. I’m a big parsnip fan so this was another great find. In addition to locally grown seeds, there were open-pollinated and heirloom seeds donated by the Heritage Seed Exchange sponsors Baker Creek Heirloom Seed Company, Seed Savers Exchange and Southern Exposure Seed Exchange and seeds from Territorial Seeds and Greenheart Gardens, a Lopez Island Seed Company. The Organic Seed Alliance (http://www.seedalliance.org/Home/), based in Port Townsend, also had a table displaying their literature. 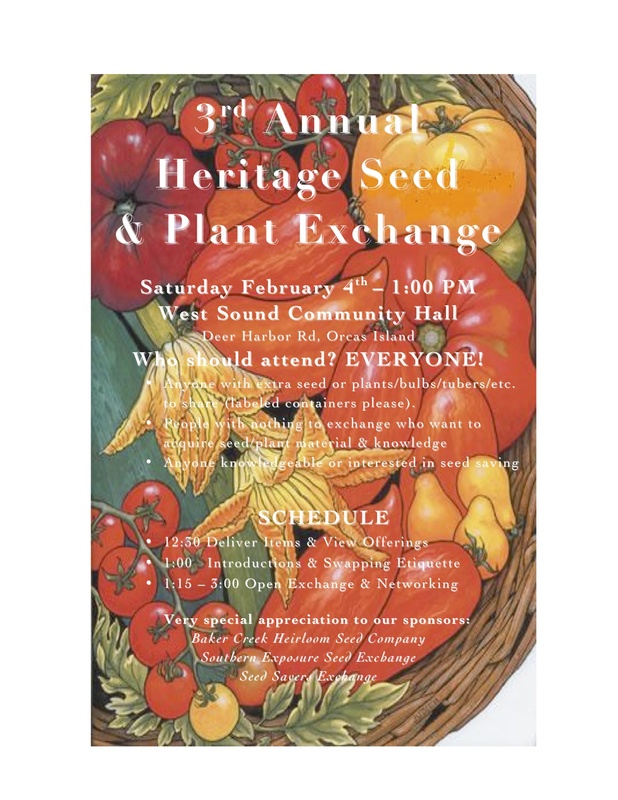 This Orcas Island Heritage Seed Exchange is just one of several local opportunities to share seeds and seed saving experiences with other gardeners. On Sunday, February 12 in Anacortes, the group Eat Your Yard is offering a seed exchange at the Senior Activities Center at 3:00: http://www.goanacortes.com/calendar/event/3474/. On Lopez Island, the grand opening of the Lopez Community Land Trust Seed Library will take place February 25th as part of the 2012 Food Charette. “This seed library is committed to providing our community with island appropriate open source seeds, fostering community resilience, self-reliance and a culture of sharing.” (http://www.lopezclt.org/seed-library-2/) As part of their work, the Seed Library has also offered a workshop on how to save seeds. I’m not a very experienced seed saver, confident only with those seeds that are easy to save, like beans and peppers, but I’m inspired to gain more experience. Suzanne Ashworth’s book Seed to Seed: Seed Saving and Growing Techniques for Vegetable Gardeners is where I’m going to start.